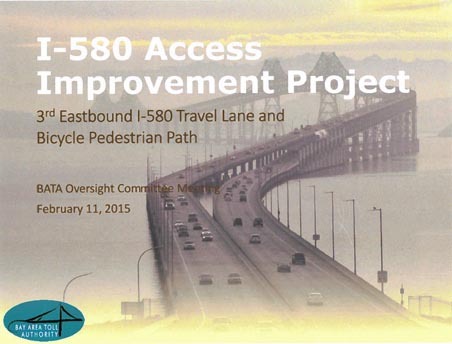 8/17/2016: To provide a bike/pedestrian link between the two counties, BATA plans to establish a path on the north side of I-580, including the upper deck of the Richmond-San Rafael Bridge, with concrete barriers to separate bicyclists and pedestrians from westbound freeway traffic. 4/20/2016 From the Caltrans Dist. 4 BAC agenda about the Oct 15 meeting: Agenda Item #6 Richmond-San Rafael Bridge Access Improvement Project Presentation Chris Lillie, project manager for MTC-BATA, gave a presentation on the project, which includes a pilot bike/pedestrian path on the upper deck of the bridge, separated from traffic with a moveable barrier, and permanent pedestrian and bicycle connection improvements at both ends of the bridge. Committee members expressed general support and enthusiasm for the project. There were concerns about closing the path during maintenance; members requested that closures be predictable, as rare as possible, and that users be accommodated either by temporarily narrowing the path, or by providing bus shuttles across the bridge. Committee members were also concerned about the ongoing use of the Sir Francis Drake flyover ramp as the bicycle route across I-580 into Marin. They requested a separated bikeway here. Chris said that other, longer-term solutions here are being considered, but they are part of a separate effort, in order to implement the bridge path sooner. 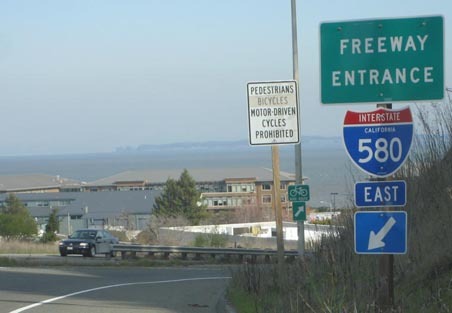 3/17/2015: Today, the Bay Area Toll Authority Oversight Committee voted unanimously to authorize an agreement with Caltrans and $4.65 million for final design of the I-580 Access Improvement Project. 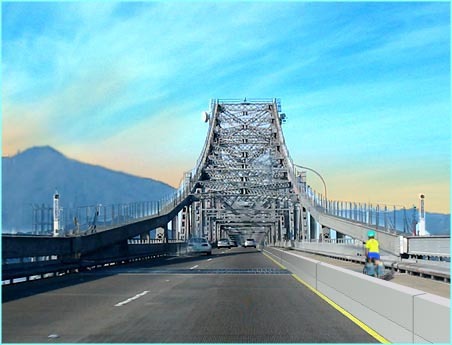 This project includes the Point Molate Bay Trail section between Marine Street and the bridge as part of providing an eastbound third motor vehicle travel lane across the Richmond/San Rafael Bridge from Sir Francis Drake Blvd. in Marin to Marine Street in Richmond. It also includes a 10-foot wide, moveable barrier separated, bi-directional bicycle and pedestrian Bay Trail on the upper deck of the bridge to connect Contra Costa and Marin Counties. The timeline shows first half of 2018 for completing the third eastbound motor vehicle running lane project with the Point Molate Bay Trail section, whereas the Bay Trail on the upper deck of bridge may be completed more than six months earlier. Staff is planning to present the Draft Architecture and Engineering Report on the planned trail to the Richmond Bicycle and Pedestrian Advisory Committee and the city’s Design Review Board. The Final Architectural and Engineering Report will be presented to the City Council during the early part of 2012. Upon city approval, the project will move into the environmental review and final design phase through the Caltrans approval process. Staff will pursue federal and state funding sources to cover an anticipated cost of $15 to $20 million. The planned trail connection will provide safe, convenient, and inviting access for bicyclists and pedestrians to the Point San Pablo Peninsula and the Richmond-San Rafael Bridge by closing a gap in the Bay Trail from Castro Street in Point Richmond to the Richmond-San Rafael Bridge Toll Plaza. The project would correct an access deficiency in the state transportation system, and facilitate zero-emissions commuting to and from the Point San Pablo Peninsula, and eventually across the Richmond-San Rafael Bridge. The project would also enhance water-oriented recreational opportunities for residents and visitors by providing bicycle and pedestrian access to the bay shoreline along the Point San Pablo Peninsula. 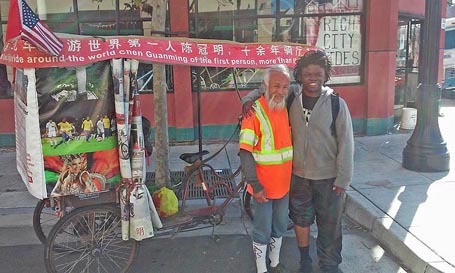 The project would complement land use development throughout the Point San Pablo Peninsula by providing low-cost commute alternatives, and by connecting the peninsula with City of Richmond greenways, parks, and shoreline developments. A route for the Bay Trail connection across I-580 to the Point Molate and the San Pablo Peninsula is close to adoption. What is remaining is the $15 million to build it and some cooperation and funding from Caltrans. Caltrans, whose Mission Statement is “Caltrans Improves Mobility Across California,” has been remarkably disinterested of late in mobility in Richmond, and should be encouraged to not only rethink the proposed 11-mile detour proposed for the I-580 Schofield Avenue and Western Drive Bridge Deck Replacements Project but also to both engage in and help fund the Bay Trail connection across I-580 to the Point Molate and the San Pablo Peninsula. YOUR EMAILS CAN MAKE A DIFFERENCE! Photo of the west-bound top deck of the Richmond/San Rafael Bridge showing the shoulder transformed into a conceptual bike / ped / ada lane with a concrete K-Rail barrier. The actual barrier would be 4' 6" high, and the lane would be 8' wide in order to accommodate emergency vehicles. This is similar to the pilot project proposed by BATA to the BCDC on 2/5/2009. And, yes, that's the legendary Mount Tamalpais in the distance.